Shirts With Random Triangles: Willie Taggart is Oregon's new head coach. In a statement released by the Oregon athletic department's website goducks.com, Oregon athletic director Rob Mullens praised Taggart and his family. "We are thrilled to welcome Willie, his wife, Taneshia, their sons, Willie Jr. and Jackson, and their daughter, Morgan," UO athletic director Rob Mullens said. "Willie places an emphasis on ensuring a positive student-athlete experience and on winning, and his previous stops have proven his success at both. We have a very bright future under his leadership." 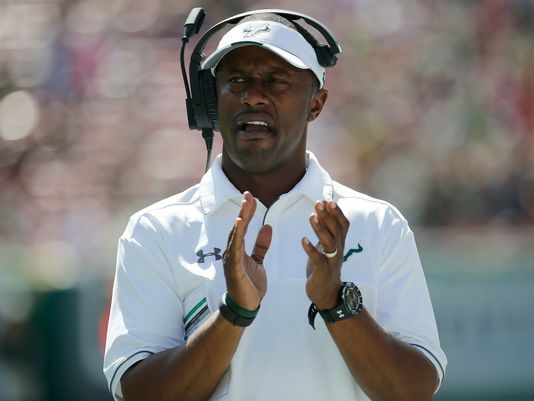 Taggart led South Florida to a 10-2 record in the 2016 college football season, and an invitation to face South Carolina in the 2016 Birmingham Bowl on Dec. 29. Taggart will replace Mark Helfrich, who was fired on Nov. 29 after a 4-8 season. Oregon will introduce Taggart to the media on Thursday.